Strengthen the enforcement of your expense reimbursement policy. 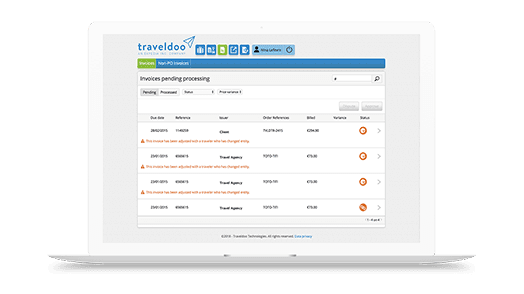 Consolidate your travel requests, expenses and payment flows. Control and validate budget allocations. Manage cash advance requests. Set up approval workflows. Integrate advance requests into your expense report management. Automate the import of payment flows and accounting reconciliation, and the distribution of accounting reports. 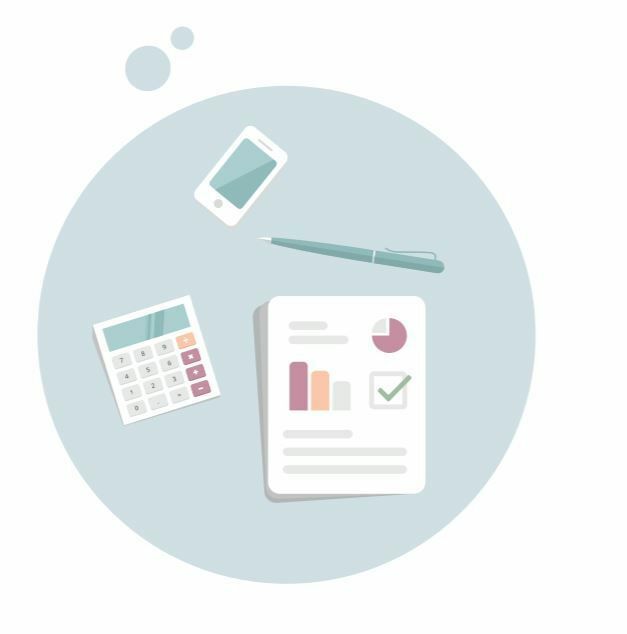 Manage accounts and automate the reallocation of expenses. Automatically integrate invoice flows, control your out-of-policy expenses, and consolidate the sources of your expenses. 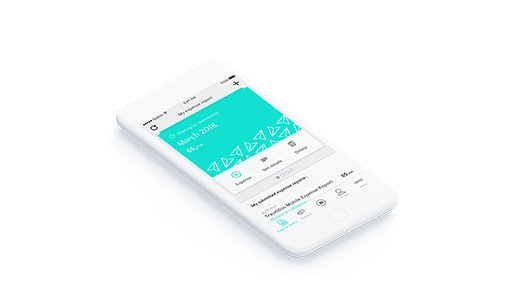 Your expense report is automatically created from your trip itinerary. 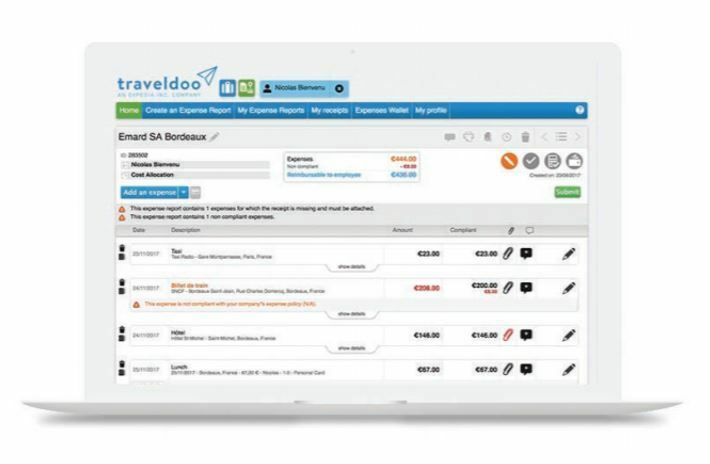 Expenses and receipts captured on-the-go with Traveldoo Mobile Expense can then be added. Import credit card transactions, duplicate repeated or recurring expenses, and use our mileage calculator and pre-set exchange rates to submit claims for mileage. Flexible configuration management to implement best practice expense management. Help your organisation optimise Travel & Expense processes and spend. Ensure compliance with internal policies and external regulations. Monitor budgets and reduce report processing times, without any administrative burden. 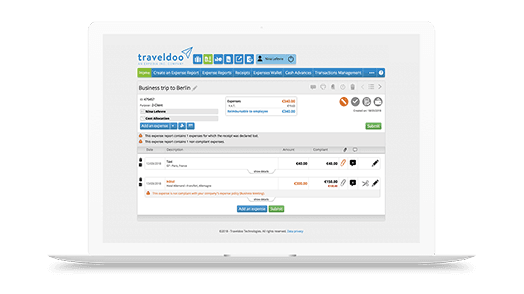 Through custom expense types, customisable expense forms and transaction split rules, Traveldoo clients can choose the level of capture detail and define expense categorization and policy exactly the way they want. Efficient approval, audit and control is easy with our multicriteria and multi-level workflows. 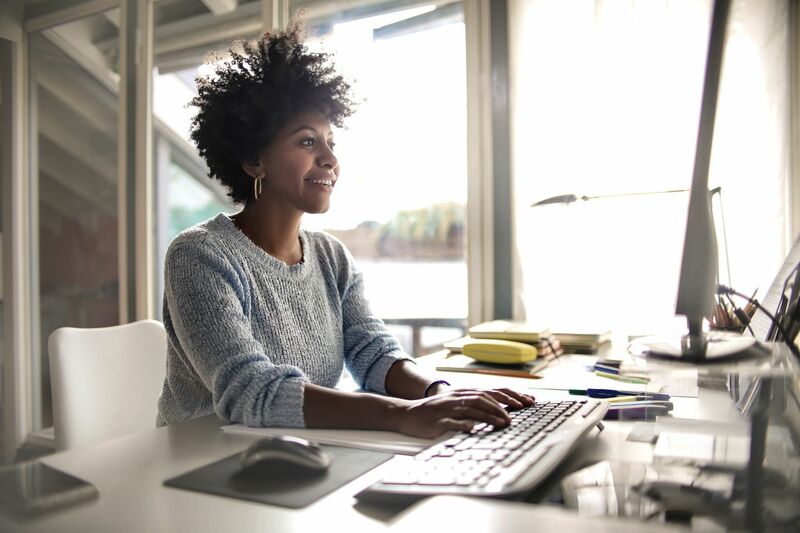 Out-of-office assistant, claim status change notifications, noncompliance warnings, pre-calculated reimbursable amounts, and approval on mobile devices ensure efficient process control. allocated and justified before reimbursement. Easily align with the general ledger of your company’s ERP, and VAT reclaim preparation. 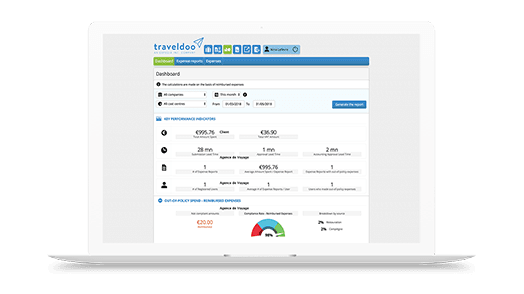 Types of expenses related to accounting codes: to help identify an expense with its correct accounting treatment, the Traveldoo solution enables you to link the types of expenses in an accounting code for seamless integration with your ERP. Detailed reports covering six analysis domains – activity, spend, compliance, price, savings, individual spend behaviour. 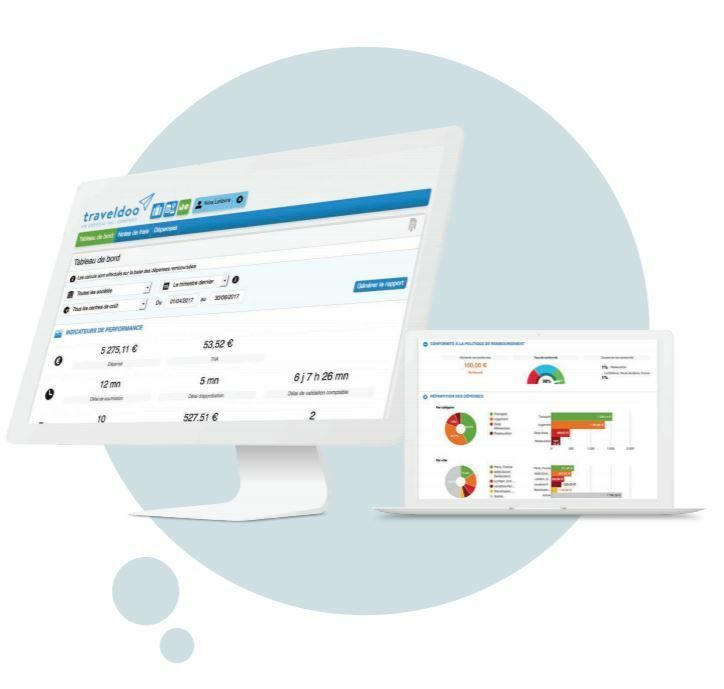 You will be able to analyse precisely and quickly how your T&E spend breaks down and evolves over time by expense type, suppliers, cost centres, accounting codes and more. Interactive dashboards will help you monitor spending trends with key performance indicators (KPIs): budget consumption, reporting activity, compliance rates, processing and reimbursement times, etc. Understand the root causes of deviations from your objectives and identify new potential savings and areas for improvement. Scan and centralize your receipts. Optimize your expense management, improve your expense reporting, and monitor your policy compliance. Analyse the status and trends of your key performance indicators from your dashboard.